SINGAPORE - Always look on the bright side of life, no matter how glaringly hot it gets. If you are bearing the brunt of the weather, let the heat motivate you to prepare this simple but tasty brew of sugar cane herbal tea. 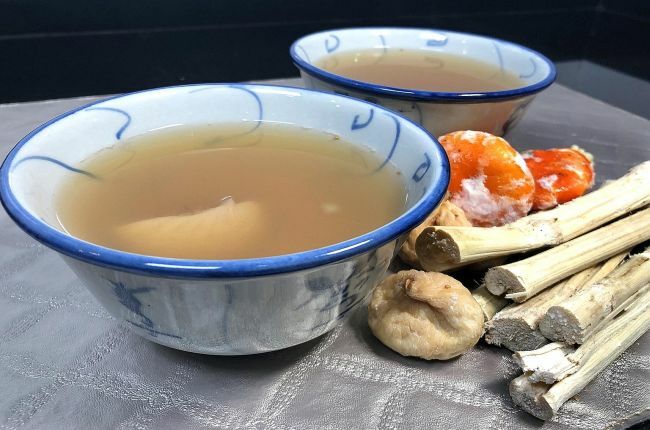 Seeing how well-received last week's Chinese pear and snow fungus recipe was, I badgered Mr Walter Chua, 47, the manager of a dried goods shop in Bugis, into sharing another brew to help combat heatiness. The star ingredients of today's recipe are dried sugar cane and golden luo han guo (monk fruit). In traditional Chinese medicine, dried sugar cane is regarded as beneficial to hydration, while luo han guo is believed to dissolve phlegm and be good for the liver. Mr Chua recommends using golden luo han guo. That is luo han guo treated with gan cao (licorice root), which is regarded as beneficial to the spleen. Using golden luo han guo does not impart a brown hue to the boiling liquid, which means your brew is aesthetically more pleasing. To get the most out of the fruit, break it apart before boiling. The concoction can give you some sweet respite from the sweltering heat. 1. Rinse all the ingredients. 2. Break the luo han guo into smaller pieces. Set aside. 3. Use a pair of scissors to halve each fig, length-wise. 4. Fill a pot with 3 litres of water. Add the dried sugar cane, luo han guo, figs, honey dates, sugared flattened tangerines and bei sha shen. 5. Cover and bring to a boil. Once the water comes to a boil, turn the heat down to low. 6. Simmer for 45 minutes then turn off the heat. 7. Allow the mixture to cool. Strain and serve.